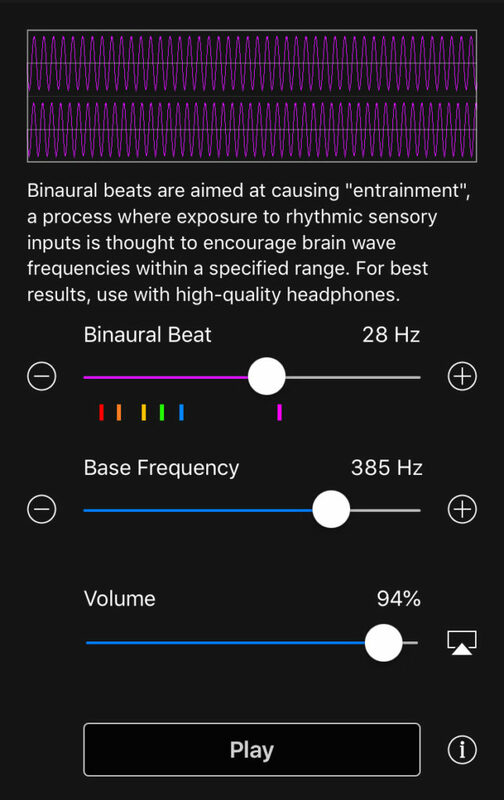 The Binaural Beats Generator app generates Alpha, Beta, Delta, Gamma, Mu, and Theta binaural beats around any base frequency. Simple modern interface allows selecting Binaural Beats from 1 to 50 Hz and a Base Frequency from 20 to 1500 Hz. Binaural Beats require high quality headphones or stereo speakers. Available for free download on the Apple App Store, Google Play Store and Amazon! Binaural beats can help with sleep, focus, and meditation. They are an auditory illusion perceived when two different tones of slightly different frequency are presented to each ear. The frequencies are very low and each one is tuned specifically for each ear which is why headphones are required. What are the different types of binaural beats? Alpha waves are associated with a restful and relaxed state that exists when both entering and exiting sleep. Beta waves are associated with concentration and moderate alertness. 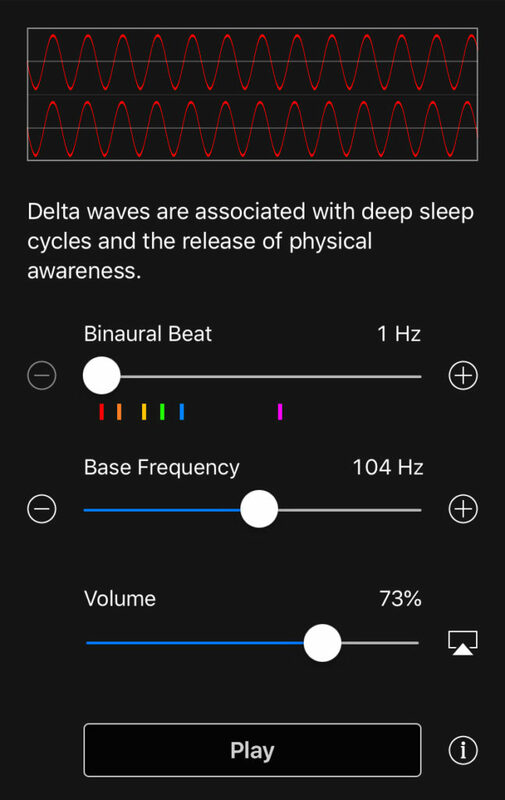 Delta waves are associated with deep sleep cycles and the release of physical awareness. Gamma waves are associated with alertness and sensitive perception. Mu waves are associated with a state of physical rest, stillness, and immobility. Theta waves are associated with the heavy relaxation that comes from frequency, deep meditation. Why can’t I hear binaural beats on my phone? Binaural beats rely on stereo headphones because each ear is played a slightly different tone to create the auditory illusion. Some binaural beats are too low in frequency for phone speakers to replicate, others will sound like a rhythmic pulse without headphones and may not work or be as effective. Plug in and use high quality headphones with the device and launch the Binaural Beat Generator. 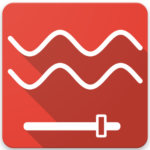 Drag slider to select a desired Binaural Beat from 1 to 50 Hz. 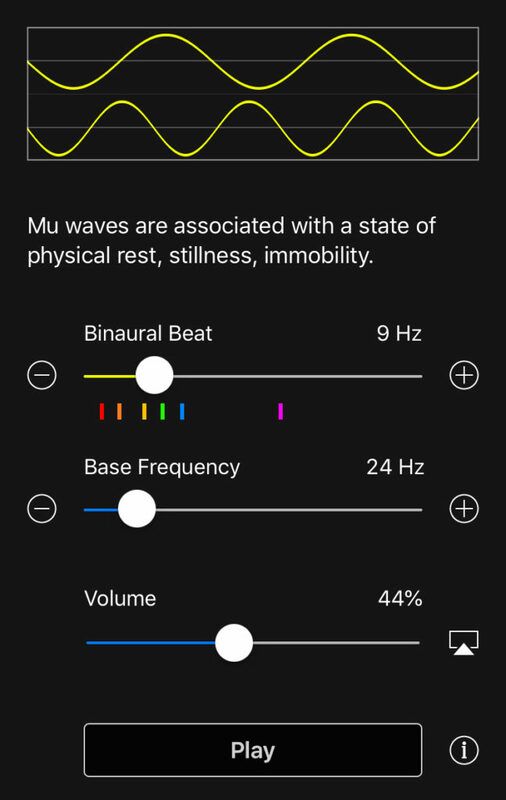 A description of each binaural beat is displayed. Drag the base frequency to a tone that sounds pleasant to your ears. The binaural beat is generated around this base frequency. Adjust device volume using the on-screen volume slider to a comfortable level. Toggle audio playback using the Play/Pause button. Check out the video we created to show you the various setting options.